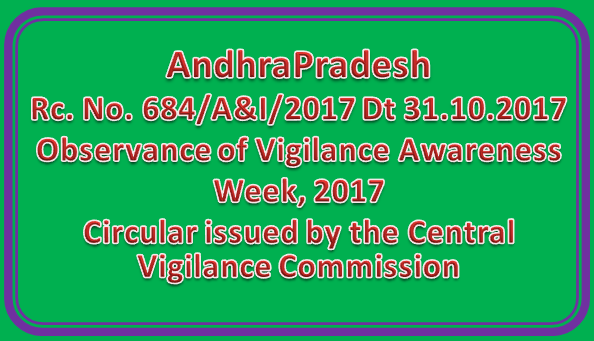 Sub:- School Education - Observance of Vigilance Awareness Week, 2017 — Circular issued by the Central Vigilance Commission — Communicated - Reg. The attention of all the Regional .Joint Directors of School Education and the District Educational Officers in the State is invited to the reference read above (Copy enclosed) wherein Government while enclosing a copy of the Circular No 08/08/2017 of the Secretary, Central Vigilance Commission, and requested all the Head of Departments to observe the Vigilance Awareness Week from 30.10.2017 to 04.11.2017 with the theme My Vision — Corruption Free Indian. The observance of Vigilance Awareness Week would commence with the Integrity Pledge by public servants in the Departments 30.10.2017 at 11.00 AM..
Further, the Government requested all the HoDs to conduct activities relevant to the theme both within the organization and outreach activities for public/citizens. Although all activities need to be conducted during the vigilance Awareness Week, however, in case of exigencies? holidays etc., the same can be conducted before or after the Vigilance Awareness Week. Therefore, all the Regional Joint Directors of School Education and the District Educational Officers in the State are requested to issue necessary instructions to all the Dy. Eos, MEOs and Head Masters of all managements to observe the Vigilance Awareness Week from 30.10.2017 to 04.11.2017 with the theme "My Vision — Corruption Free India". The observance of Vigilance Awareness Week would commence with the Integrity Pledge by public servants in the Departments 30.10.2017 at 11.00 AM.amd submit the observance of Vigilance Awareness Week may be sent to this office as per the pre format by 10.11.2017.